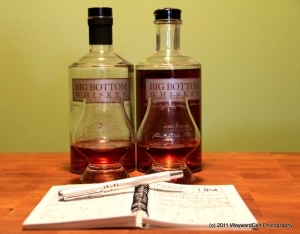 You may recall this post a while back where I discovered Big Bottom Whiskey and subsequently fell in love with their port cask finish. So much that I had bought two bottles of it, when I normally would only by one of any single whisk(e)y. And here’s where I was actually a bit smart: I had retained 1/4 of a bottle of the first batch with the specific intent of doing my own side-by-side tasting with batch two. Right off the bat, before even opening the bottles, there’s a noticeable difference: Batch one was aged two years, batch two was aged 3. While the distillate is from the same producer, they are aged for different times and finished in port casks at differing lengths of time as well. But really, that’s all irrelevant until you can actually taste it, right? Or at least until you can read my tasting notes below, after which I’ll likely wax on about more of the differences…. Nose: Heavy caramel followed by fruitiness of the port. Surprisingly no oak on the nose at all. Flavor: Caramel oak, then the fruit of the port. Deep richness to the palate, and shows off the port finishing. Finish: Just a hint of chocolate on the back, balanced with the tannins of the oak and fruit. Extraneous Notes: The colour on this first batch is a deeper red hue showing the influence of the port cask. I gave this a B+ as it finishes a bit more harshly than a whiskey like this should. I’d expect the port cask finishing to have reduced any lingering harshness to non-existence. Still, quite tasty, so high marks are deserved. Nose: This noses hotter than the first batch, with immediate fruit forward, followed by the sweetness of caramel. Overall a mild nose once past the initial heat. Flavor: Chewier with a mouthfeel reminiscent of nougat. 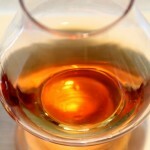 Heavier oak with a deeper more complex caramel note. Light port touch with the fruity sweetness peeking out in the middle. Finish: Oak tannins then mild char and caramel in the front while a hint of port maintains the background through the length of the finish. The port cask finish on this one has seemingly married all the flavours into a deeper complexity and balance. Extraneous Notes: The colour of this one, oddly enough, was a more orange-ish hue, still rich, but lacking that deep red from batch one. Batch two received an A- here because it doesn’t finish as clean as I’d like. There was a lingering mild bitterness and dryness from the tannins when I had wanted a bit more fruitiness on the end. A wetter finish would have landed this dram at a solid A/A+. So there you have it, a side by side comparison of batches one and two. I’d actually left some in each glass for Jean to enjoy when she got home (I tasted late afternoon when she was still at work, but I’d quit for the day). But I was a bit cruel about it, as I removed the bottles from the table and made her do a ‘blind’ taste to see if she could pick out which was which. 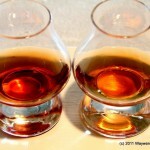 Because batch one’s visual cue would typically indicate ‘older’ and that batch one tasted more of port, she incorrectly chose that as the newer release and noted it was her preferred of the two. Understandably so, since darker colouring tends to make people think ‘older’ and the fruit forwardness of the port finish in batch one lends to her sweeter palate preferences. And I nearly did the same thing too, until I had some of batch two and found my palate was much happier with the balance found there and less of the sweetness of batch one. But this is why there are so many whiskies out there: for every dram, there is a palate that will love it and one that will hate it, and others everywhere in between. Luckily both Jean and I found batches one and two to be equally enjoyable as good drinking whiskies (even if my more technical attempts at notes show less equality). To wrap this up: Batch one is likely going to be difficult to find at this point, but batch two just hit the local shelves in Portland, Oregon and will likely be making its way out to a liquor store near you soon! Go pick up a bottle or two, you won’t be disappointed in the newer release. And maybe, if you can stave off temptation long enough, you can do a side-by-side with batch three, assuming Ted will be doing one…. Here’s to hoping! 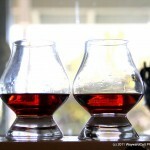 This entry was posted in American, Regions and tagged big bottom, bourbon, comparison, port cask, port finish, whiskey. Bookmark the permalink.